On November 17, 2011, a small four-person airplane carrying Oklahoma State University women’s basketball coach Kurt Budke along with his assistant Miranda Serna crashed in Perry County, Arkansas, killing the two individuals along with the pilot, Olin Branstetter and his wife Paula. I remember the incident mostly because I was taking a graduate class here at OSU at the time and one of my fellow students was on the basketball team, which gave the tragedy a more personal connotation than it otherwise might have. The days and weeks after the crash were difficult for many people on campus especially since it was almost exactly ten years after another plane crash took the lives of ten individuals on the men’s basketball team, whose lives are celebrated each year at OSU’s annual Remember the Ten Run. In any tragedy such as this we have to figure out a way of going forwards with our lives while also memorializing those who were lost, and learn to hold on to the past while not letting ourselves become crippled by it. Easy words to type, certainly, but a lot more difficult in practice, and I don’t know that there’s ever going to be an easy or simple answer for how to move on after the loss of loved ones. And if there is, I’m not sure I even want to know it. In the wake of the plane crash in November 2011, OSU sought a way to pay respect to the fallen and honor their memories and the memorial you see pictured above is the final result. Construction was finished a few months ago and I have biked past many times while also stopping to look at the pictures and read about each one of the individuals via the epitaphs engraved on each of the markers. It’s a somber scene, but serves as a way for me to think back on these lives while also serving as a reminder to hug my wife and my two kids a little closer each day when I get home from work. On the morning I took this picture I had just biked past the memorial when I noticed the buildings in front of me, as I faced west, turn a deep orange almost like the Lord pushed the saturation slider all the way to the right. I stopped, turned around, and saw one of the most stunning sunrises I can recall in recent memory which I quickly attempted to capture with my D7100 and 50mm lens. I reversed course and crouched down in the parking lot just to the west of the memorial, moving myself around a bit so as to position the slabs of granite between two trees while also getting a good view of the sky behind them. If this picture looks photoshopped, I promise you it’s not. Well, not very much anyway. I adjusted the black levels just a bit but otherwise what you see here is pretty much exactly what I got to see on this chilly January morning. 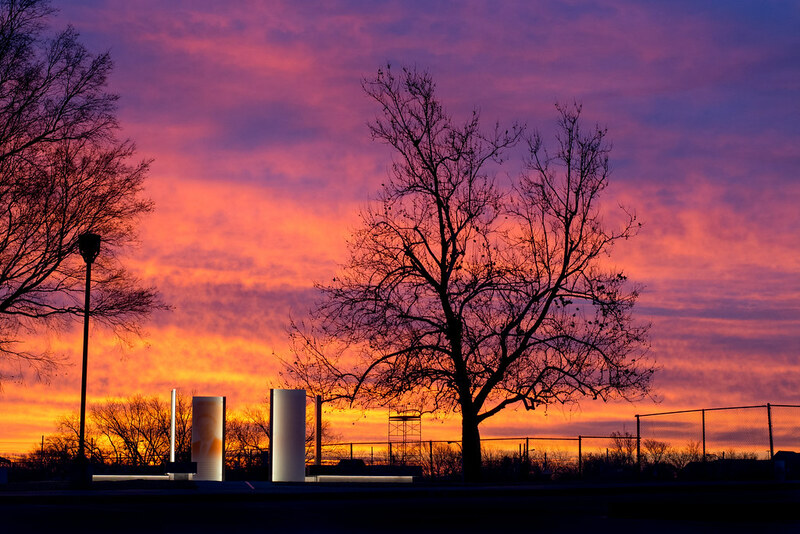 The memorial is bathed in a perpetual white thanks to the light fixtures installed around it, which highlights them in stark relief next to the brilliant orange and purple sky. As I got back on my bike and continued my ride around the stadium I was struck by how quickly the scene changed, and in less than two minutes the sun was over the horizon and the richness of the morning colors had faded away. It was a quick reminder of how fleeting so many things in life are, and also how important it can be to pause for a minute and spend time to appreciate what we have right in front of us before it’s gone. Beautiful photo–beautiful and thoughtful words. Thank you. Thank you for noticing the opportunity and making this image, that is made all the more meaningful by the explanation. Experiences like this do help us to realize that time is fleeting and we need to be living in the moment, or we will miss those glorious moments. Thanks Dennis. Time really is fleeting, and I need to do a better job of really seeing what’s in front of me on a daily basis. Awesome photo, Simon! You did not get that by staying in bed, did you? One of the best photos I ever shot back in the day when I took over 3000 pictures for my 4 slideshows, was taken in Iowa. I climbed out of bed at 4AM and got to the border of Nebraska around 5:30, where I took a picture of a sunrise coming up behind a black pine tree. It was an amazing shot! I then sold quite a few of those by framing them in in barn wood. You know, back in college I thought I was cool because I slept in until 10am. I wish I could go back in time and kick my own behind for wasting so much of the day! Wonderful photo and elegant commentary. Thank you! Thanks Dennis, I really appreciate you saying that.